Tired of running out of Hot Water? Tankless water heaters can provide an instant supply of hot water as soon as you turn the faucet. 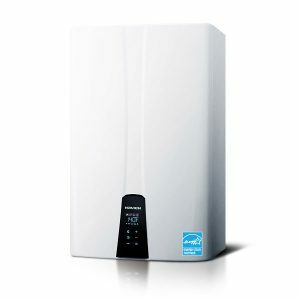 The tankless water heater senses the need for hot water and starts providing it instantly. No more wasting money on storing hot water when it is not needed. If you are in need of a residential or commercial plumbing company in Pittsburgh or the surrounding area call 412-793-8000 today and speak with a friendly and knowledgeable representative. You can also fill out the contact form on the right or email us at info@schultheisbros.com and we will respond shortly. They last five to 10 years longer than a traditional hot water tank. They are more efficient with no standby heat loss. They take up less space and can be be installed on walls. They provide savings on your hot water heating bill. Schultheis Brothers works hard every day to refine the latest methods in order to become more efficient, helping to reduce costs and provide you with affordable plumbing services in Pittsburgh. If you are in need of a residential or commercial plumbing company in Pittsburgh or the surrounding area call 412-793-8000 today and speak with a friendly and knowledgeable representative. You can also email us anytime at info@schultheisbros.com or fill out the contact form on the right and we will respond shortly.